My house is full of all kinds of dragons. So I just had to pick this book to read. I also found another new author! This will be another series to read as it felt really real. Madelyn is an orphan. She wants to finish her Dragon paper to stay a teacher. She meets Grigori, from Moscow, because she doesn't believe in dragons and he is one. He takes her to his home to see how much she knows. Then his brother comes home injured and she starts to see something isn't right. He killed the son of their enemy. Of course you then have to fight back. In the meantime Madelyn finds out who she is. Major Spoiler! There is a switch to the fight. It is interesting. I really liked this book and there are more coming. I would recommend every one to read it. Don't let it get away! Check it out! Enjoy reading it! Madelyn Haynes has always had a fascination with dragons. She is in Russia to study the ancient books on lizard like dinosaurs, they must be where the folklore around dragons started. Dragon shifter, Grigori Barinov has been alerted to someone investigating dragons and accessing a certain book that could cause him and his family problems. Our heroine has got a lot of surprises coming, some about the world around her and even some about herself. She can´t remember her parents because they died when she was tiny. Her nightmares are the reason for her obsession with dragons. Our hero has to protect his family above all. There are other dragons who would love to wipe them out. He and his brothers are the last of his family line. As an apex predator there is not much that can kill them. His father wiped out the only other creatures besides other dragons that could. We have some surprising battle scenes and a love scene that had me giggling. Our heroine is a knockout. This is the start of a series with wonderful characters. There is a bit of intrigue that may carry through to the next books, because we know there is someone who works for the family and their enemy. The brothers will hopefully all get their own story. I will certainly be reading them to find out. The writing is acceptable but totally empty on descriptions. The characters are deep as a biscuit and always contradicting themselves every chapter. The plot is so linear that every possible plot twist is predictable. The world building idea is beautiful but bad developed. I’m sorry. Read it if you want a very light read and having nothin else to do. 'Grigori' by Lauren Smith is the First Book in a New Series called "Brothers of Ash and Fire". This is the story of Grigori Barinov and Madelyn Haynes. Madelyn has always been fascinated with Dragons and now has taken it so far as her job. Madelyn set out to prove that dragons did exist at one time. While working on her PhD in mythology in Russia she happens upon a book about Dragons by a author a first she thinks is do real research but then in his book he showcases a family that are dragon shifters. Madelyn gives the book back because she knows that book is not about a real siting. Grigori has been alerted that some one requested his family book from the Library. Grigori rushes over to the Library to try and catch the person who is interested in his family. Grigori thinks there is a threat there and wants to know who is trying to look into Dragons. 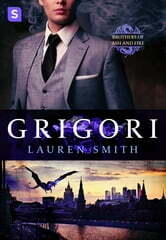 Grigori tracks down Madelyn who he feels a instant attraction too and his Dragon doesn't want to let her go. Madelyn is afraid of Grigori at first. Who wouldn't be when someone enters your hotel room demand answers from you and then you are taken to his home. But it doesn't take Madelyn long to start to feel something for Grigori but how will she react to his big secret?I appositely love Ms. Smith writing and try to read ever book she puts out. I totally enjoyed this book and can't wait for the next book about one of Grigori brothers! "My honest review is for a special copy I voluntarily read."